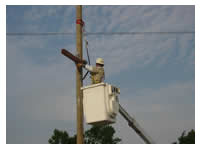 A user is standing in a movable bucket and lifted by the boom to an elevated position next to a pole top. He is connected to the bucket using a Wishbone TM device releasable tether and is provided protection from falling out of the bucket. When the person is positioned next to a pole he would connect the second "D" ring non-releasable tether connector to an anchor (i.e. choker) on the Pole, which is totally independent from the bucket. 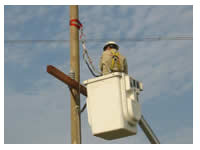 If the boom or bucket should fail or collapse while the user is positioned next to the pole, the "Wishbone" system would separate the user from the bucket as it fell away and the person would remain supported by the pole. 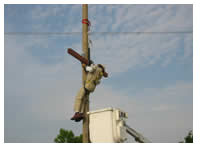 As in example one a user is standing on an aerial lift platform and raised by boom to an elevated position next to a structure. He is secured by a Wishbone TM releasable tether to the lift and when he is next to the structure he attaches the second "D" ring non-releasable tether connector to a structure anchor point, he can then un-connect the releasable tether from the lift and transfer to the structure while being fully tethered and supported. Should the lift platform fail or collapse or move before the user un-connects from the aerial lift the Wishbone TM system would separate from the aerial lift leaving the user supported by the structure. User operating an Aerial lift or bucket truck, attach releasable tether connection with short positioning lanyard to bucket or platform lift, connect non-releasable tether lanyard with shock arrester to Boom attach point. This connection helps to prevent flip outs and tip outs. In the event the bucket or lift fails the Wishbone TM will release the connection to the bucket or lift leaving the user secured to the boom attachment. copyright © 2005 Fornet Solutions Inc.